Microprocessor Flame Photometer – 1381 | Electronics India - Manufacturer, Supplier and Exporter of Analytical, Scientific Laboratory and Pharmaceautical Instruments in India. 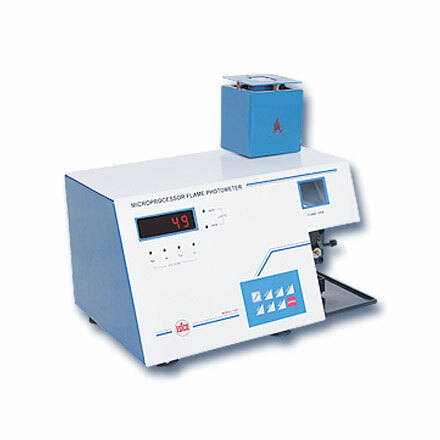 Microprocessor Flame Photometer – 1381 is an ideal instrument for the determination of sodium, Potassium, Calcium and Lithium. It uses the latest microcontroller technology and advanced engineering techniques so as to give enhanced and reproducibility. The System has 3-Point calibration facility using curve fitting software. It has soft touch membrane key for ease of operations. The sample solution is aspirated through an automiser. Sample, Air and the fuel are mixed in the mixing chamber which is then sprayed as a very fine mist into the flame. The color of the flame is changed depending upon the concentration of elements present. Radiations from the flame passes through the sensing system and specific narrow band interference filter which permits only the characteristic radiation to pass to the photo-detector. The output of the photo-detector is then processed by the microcontroller and the final results are displayed on the digital display. Note : Specifications are subject to change due to continuous improvements.